Kittery is the first town you come to in Maine, just over the border and over the bridge from Portsmouth, New Hampshire. Kittery was the first incorporated town in Maine in 1647. 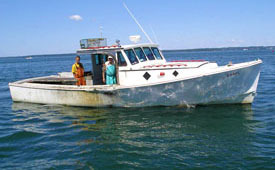 With amazing history dating back to 1623, Kittery was first settled and established as a fishery. Kittery encompasses Badger Island and the Isle of Shoals off shore from Portsmouth Harbor. Kittery is a great shopping town, with Kittery Outlets, but there is a waterfront side to the small town of Kittery Point that makes it deserving of a vacation spot. Things to do in Kittery. Thanks to Kittery's proximity to Portsmouth just across the Piscataqua River and York, it is an ideal choice for a vacation stay as you can get the best of both words in New Hampshire and Maine. However, there is still much to entertain in Kittery. The Portsmouth Naval Shipyard is actually located in Kittery, Maine, despite its name implying that it is in New Hampshire. Here The USS Constitution and The USS Kearsarge were built on Seavey Island, which later became a prison and is now defunct. 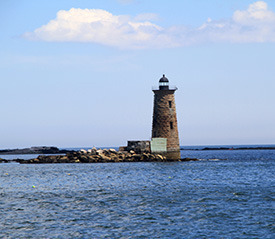 A tour of Portsmouth Harbor and the Piscataqua River is the best way to see this southern most Maine shoreline including Pepperrell Cove, Kittery Point and Whaleback Light that guards the entrance to Portsmouth Harbor. You can take a ferry to tour the harbor out of Kittery or Portsmouth. Kittery Point juts out as a peninsula dotted with beautiful seaside homes and peaceful coves. When you are in Kittery, you should visit Seapoint Beach and Fort McClary, a 19th century military fort that protected the mouth of the Piscataqua River and Portsmouth Harbor. Named for N.H. Major Andrew McClary who died in the Revolutionary war at the Battle of Bunker Hill, Fort McClary is a state historic site and museum, not to mention a beautiful seaside park for a picnic. Chauncey Creek is a nice scenic drive near Pepperrell Cove where you can stop by a few restaurants off of Rt 103 after visiting the fort. The oldest continuously run family store in North America is located on Kittery Point too, Frisbees Market since 1828. 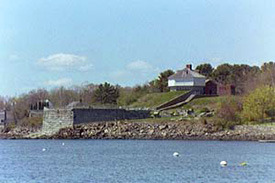 Fort Foster park is another great Kittery sight, home to three small beaches including Whaleback Beach and Rocky Beach. The park is located on Gerrish Island and easily accessible by car and its proximity to the harbor offers nice views of Whaleback Light, Portsmouth Harbor Light and Fort Constitution. Visitors can spend an entire day walking or biking the trail system, picnicking, and exploring remnants of military fortifications. This coastal town is probably best known for having some of the best outlet shopping in New England. There are over 120 Kittery outlets along a one-mile stretch of Route 1, just off I-95. The most famous shop is Kittery Trading Post, a three story shopping experience for outdoor enthusiasts with everything from camping, hunting and fishing supplies to ski, snowboard and kayak equipment. Thanks to the Kittery Outlets, the town is bustling year-round. Even during the winter, Kittery is quite busy, especially before Christmas when people come to get their holiday shopping done. Kittery also hosts some great restaurants, whether you hanker for a clam or lobster roll at a roadside shack Chauncey Creek Lobster Pier or Misto Cafe Bistro, or Anneke Jans. Lodging in Kittery ranges from brand name hotels and motels near the outlets to cozy b&bs and inns near the waterfront.